Tyne Bank Brewery: Wilson's Birthday Beer. This September Wilson Barbershop Co. celebrate their second birthday at one of favourite pubs in the world, The Brandling Villa. We've teamed up to supply a unique beer for the event, which takes place at the Villa on 5th September. The beer needs a name, and we need your help. Wilson are based just minutes from the Brandling Villa in South Gosforth, and with most of the folk who get their hair cut and beards trimmed by Robyn and her team, the pub is their local. The beer will be a 4% pale ale brewed using a blend of Southern Hemisphere hops, and dry hopped with a 'yet to be decided' combination of New Zealand hops. Expect big, juicy tropical and citrus notes with plenty of aroma and a biscuit-like malt base. 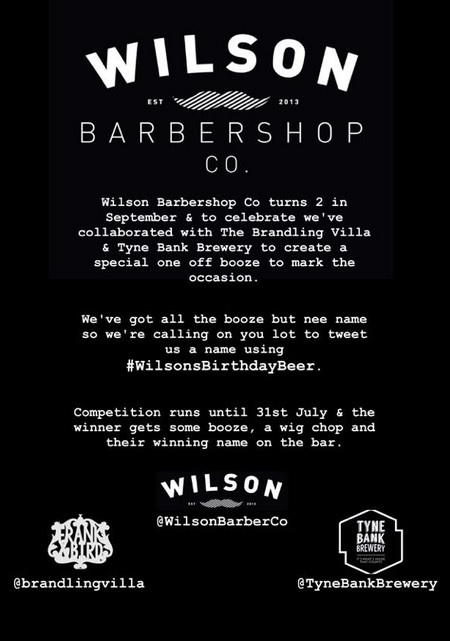 Tweet your suggestions using the hashtag #WilsonsBirthdayBeer and we will decide the winner, you have until Friday 31st July. The winning name will of course be featured on the beer's pump clip on the night of the event, and you'll also win a free hair cut and a beery prize. We're already enjoying some brilliant suggestions, it's going to be tough one to decide so get thinking and tweeting! Good luck.